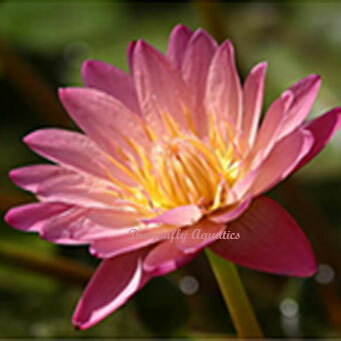 This exotic hybrid tropical waterlily has cup-shaped blossoms with petals of light orange to apricot that contrast nicely with heavily mottled light green foliage. Thrives in any size pond and is a profuse bloomer and will tolerate partial shade or just four hours of sunlight. Buy 5 or more for $31.99/ea. Buy 10 or more for $28.99/ea. Buy 15 or more for $25.99/ea.